If you like your dining experiences crazy, Japanese and robot themed, then Robots Unlimited is going to get you kinda excited. 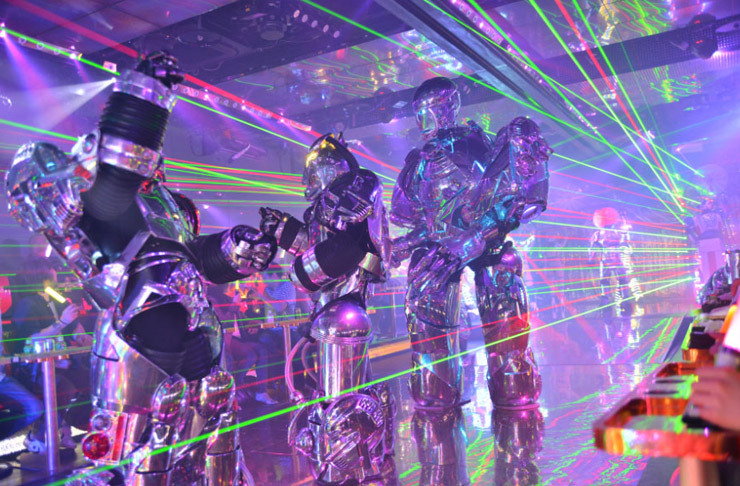 The world-renowned Japanese Robot Restaurant is coming to Sydney for the 23rd and 24th of February to give Sydney-siders an eye-popping glimpse of Japanese culture. Hailing from Tokyo, the Robot Restaurant reaches new levels of sensory overload as scantily clad girls dance around huge robots. Sounds crazy? Well, that’s because it is. While munching down on delicious and authentic Japanese food and beverages, you will be taken on a futuristic journey bordering on the insane (we wouldn’t expect anything less from the Japanese). We’re talking enthusiastic dance routines to J-Pop, lasers flashing everywhere and most importantly, huge robots battling it out. If this kind of over-the-top and highly entertaining dinner idea gets your circuits shorting, be sure to register for tickets here. Tickets go on sale at the end of the month and those who have registered get first dibs. A pop-up restaurant this wacky and wonderful is sure to be popular, so go on, give yourself an excuse to spend a weeknight feeling like you’ve been transported to the bright lights of Tokyo.